Not Registered?Still need to become one of our thirsty clan 158,694 strong? I'm happy to fill your glass! Thanks so much for signing up for my 30-day free trial. If you join now as a Paid Member, you'll get access to all my reviews on my website and on my mobile apps for 1 or 2 years, plus your free 30-day trial. You have nothing to lose except mediocre wine and wasted money. 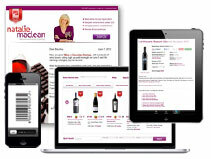 I guarantee you'll be drinking delicious wine when you join as a Paid Member or you'll get a full refund. Interested? Check your email inbox for the note I just sent you to confirm your email address and get your temporary password.